Do you travel a lot? Do you often have to go on business trips? Do you look at planes with anxiety? Do you go to work to another town? High-speed SkyWay is exactly what you need. Imagine innovative automated, comfortable, safe, cost-effective public transport, able to travel at the speed of 450 km/h along the rail track structure, located at the height of 5-10 m above the ground. It is a new word in passenger transportation. Obviously, at present there is available high-speed railway transport. However, the system of high-speed SkyWay is more efficient, faster, simpler and significantly more cost-effective in construction and operation. 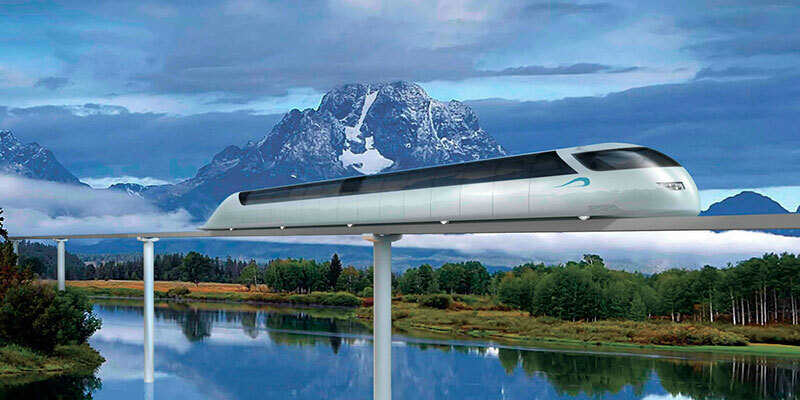 High-speed SkyWay is designed for passenger transportation between cities, regions, countries and continents. Travel speed - up to 450 km/h. Rolling module passenger capacity - up to 6 persons. Rolling stock passenger capacity - up to 60 persons. Declivity - up to 15%, with special design - up to 30%. Transportation distance - up to 10,000 km. Volume of high-speed intercity transportation - up to 1 mln passengers per day. Cost of high-speed track without regard to rolling stock, passenger railway stations, terminals and infrastructure - from 3 mln USD/km. Net cost of transportation - 5 times lower than net cost of transportation by high-speed railway, magnetic cushion trains, planes. Availability of anti-derailment system at high-speed rolling stock. Tenfold safety margin of bearing string elements in transport overpass. Resistance to glaze ice and icing, snow drifts and dust storms. Operation reliability at extreme air temperatures. High resistance to vandalism and acts of terrorism. tsunami - with wave height up to 20 metres.